Cole and I received a goodie bag of dog toys on my door along with a "Taste of Home" magazine all about Cheesecakes from Tia with a request for a Mallow Cranberry Cheesecake. 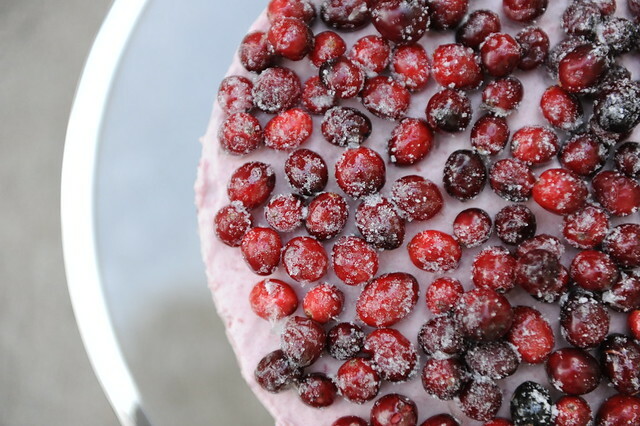 I am not a big Cranberry person myself, but it certainly looked pretty with all the sugared cranberries on top. Here is a little video of the baseball squeaky toy that had Georgia a bit perplexed, but still "all in". 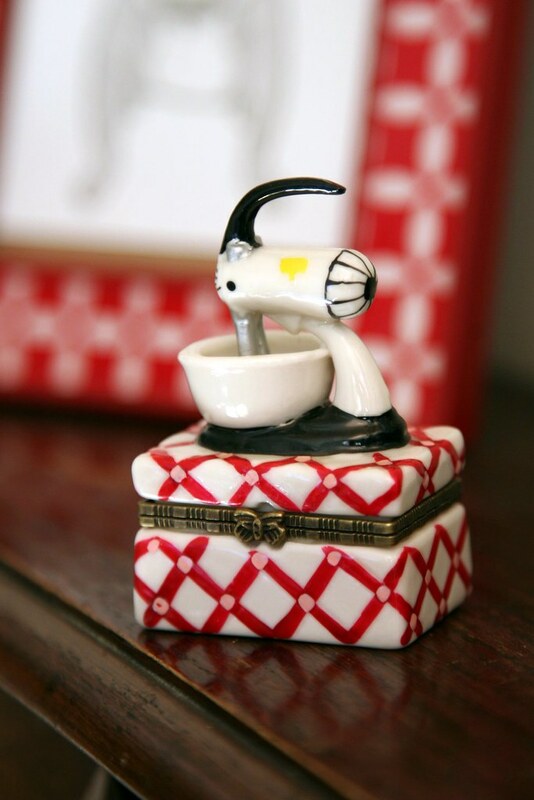 In our litte gift bag, Tia also left this cute Limoges-type box with an Electric Mixer sitting on top of it. It even had a miniature cake inside. It fits right in! 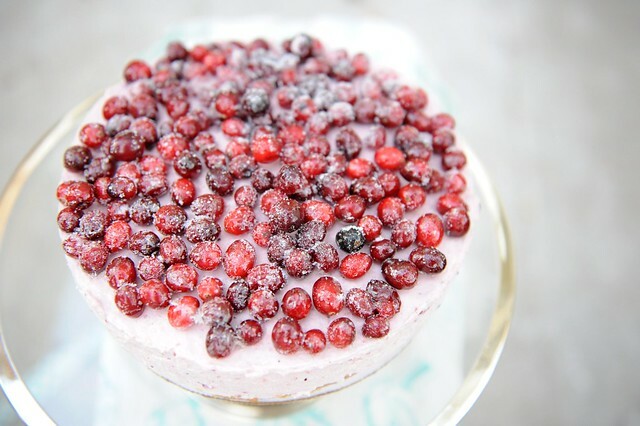 Here is the mallow cranberry cheesecake with sugared cranberries on top. The crust was graham cracker and macadamia nut. I really like the look of these sparkling cranberries. Ooh, I just got an idea for a Thanksgiving centerpiece. Thanks Tia for our bag of treats! In a small saucepan, sprinkle gelatin over cold water; let stand for 1 minute. Heat over low heat, stirring until gelatin is completely dissolved and let cool for a few minutes. In a large bowl, beat together cream cheese and marshmallow creme until smooth. Add in cranberry sauce and cooled gelatin and mix on low to combine. In a small bowl, beat heavy cream until stiff peaks form. Fold into cream cheese mixture. Pour over crust. Refrigerate for 8 hours or overnight. In a microwave-safe bowl, sprinkle gelatin over cold water; let stand for 1 minute. Microwave on high for 1-2 minutes, stirring every 20 seconds, until gelatin is completely dissolved. Whisk until slightly frothy. Lightly brush mixture over all sides of berries. Place on a wire rack over waxed paper; sprinkle with superfine sugar. Let stand at room temperature for up to 24 hours (do not refrigerate or the sugar will dissolve). To Assemble: Just before serving, carefully run a knife around edge of pan to loosen. 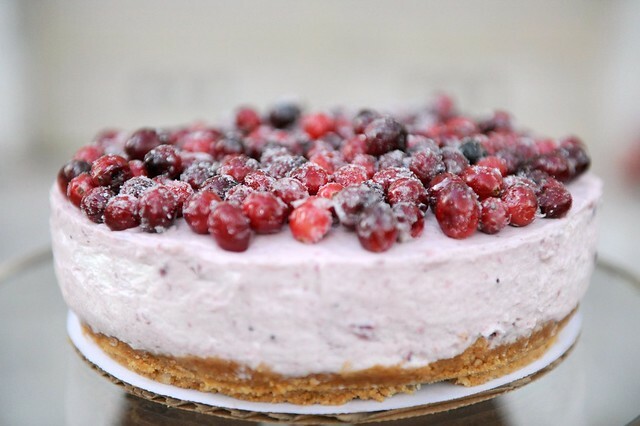 Spoon sugared cranberries over cheesecake.